For countries experiencing or emerging from a period of conflict and repression, justice via the court system is often a primary pillar in any comprehensive transitional justice policy. Before international or hybrid judicial processes are considered, the domestic judiciary is often first assessed as a possible preexisting mechanism that may be able to provide a remedy in the realm of criminal justice for the most serious human rights violations. A capable domestic judiciary can, in fact, help contribute to a narrative after a period lacking in transparency and further institutional reform through legal interpretation and the setting of new norms. However, even a well-functioning domestic judiciary may not necessarily result in accountability for every abuse committed. For this reason, domestic trials cannot be the only transitional justice mechanism relied on by a country. 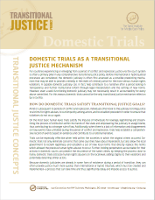 How Do Domestic Trials Satisfy Transitional Justice Goals? Amid or subsequent to periods of conflict and repression, individuals often look to the judiciary to bring justice to victims for rights abuses, to curb impunity among actors, and to establish precedent in order to ensure that violations do not occur again. On the most basic human level, trials satisfy the impulse of individuals for revenge, legitimizing and streamlining the process of retribution within the hands of the state and empowering the judiciary to assign blame, thus contributing to a stronger rule of law. Additionally, when there is a lack of information and disagreement on how events have unfolded during the period of conflict and repression, trials help establish a comprehensive record of events based on evidence and contribute to a national narrative. Trials can be especially effective when held within the societies in which the original crimes occurred. Domestic trials not only eliminate concerns that some countries have about imperialism, but also allow the local government to reclaim legitimacy and establish a set of new local norms that directly replace the norms which allowed the previous human rights abuses to occur. Further, holding perpetrators accountable for their actions in domestic courts can prevent the recurrence of the same crimes; by keeping the process close to home, domestic trials ostracize human rights abusers on the local level, adding stigma to their violations and potentially deterring similar actors. Because domestic judiciaries are already in some form of existence during a period of transition, they can often provide justice much more quickly than international or hybrid tribunals, which must be created and implemented—a process that can take time and thus significantly delay and impede access to justice. What Are the Downfalls of Domestic Trials? At the same time, domestic authorities may not have the political will or resources to prosecute crimes, and domestic judiciaries in societies undergoing or recently emerging from periods of conflict and repression may often be in need of reform and thus unable to deliver justice in their current form. One oft-repeated criticism of domestic trials is that they tend to focus on the perpetrators of the crimes rather than the victims. While trials can be effective in condemning the crimes that were committed and establishing punitive measures, trials often leave the victims of crimes without proper financial, societal, and psychological remedy. There are also serious concerns about neutrality within domestic trials. While new governments seem to stand to benefit from condemning prior human rights abuses, these governments also grapple with a desire to maintain stability; this balance may lend itself to leniency in prosecution for the sake of political expediency and in order to avoid confrontation. Additionally, in situations in which new governments are not sufficiently distinct from their predecessors, there may be an unwillingness to prosecute allies and investigate crimes in which members of the post-transition regime may actually be complicit. Despite the fact that abuses are frequently perpetrated by more than one party in periods of repression and conflict, officials often only choose to prosecute crimes perpetrated by the losing side, thus furthering the notion of “victor’s justice,” creating bias within the narrative established by said trials and ultimately depriving the process of fairness. Additionally, countries emerging from serious periods of repression or conflict may be in need of legislative, judicial, or institutional reform, or even all three. For officials to rely on the prosecutions of a previously existing system that is in need of reform may end up perpetuating greater injustice. How Do We Measure the Success of Domestic Trials? On the most superficial basis, the success of domestic trials can be measured by the number of prosecutions and convictions; however, numbers often leave much nuance to be desired and may play into the desire for retribution over justice. More apt and concrete measures are likely to be determined based on a number of subjective contextual factors, including the degree of truth revealed via the trials, the reparations awarded to the victims, the remorse expressed by perpetrators, the recognition of the process by the official government, the ability of the trials to curb any prior culture of impunity for the crimes in question, and the institutional reform to which the trials contribute. International Center for Transitional Justice. “Criminal Justice.” https://www.ictj.org/our-work/transitional-justice-issues/criminal-justice. Lowy, Ryan M., and Patrice C. Mcmahon. “Home Court Advantage? Domestic Trials and Transitional Justice in Bosnia-Herzegovina.” In The Development of Institutions of Human Rights, 99–113. New York: Palgrave Macmillan, 2010. https://doi.org/10.1057/9780230109483_7. Meernik, James D., Angela Nichols, and Kimi L. King. “The Impact of International Tribunals and Domestic Trials on Peace and Human Rights After Civil War,” International Studies Perspectives 11, no. 4 (November 2010): 309–334. https://doi.org/10.1111/j.1528-3585.2010.00414.x.